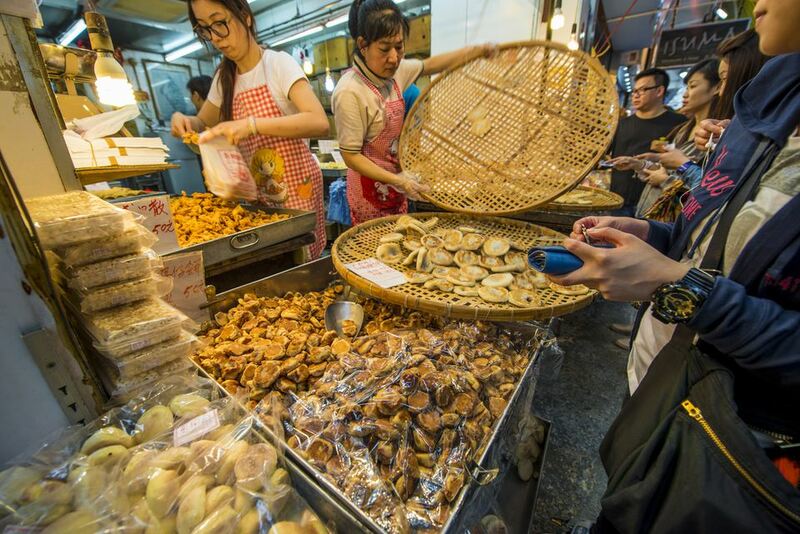 Hong Kong can be a minefield of strange smells and even stranger tastes, and before you sit down at the city's restaurants you should take a look at what you might be sinking your teeth into. Below you’ll find a profile of ten weird Hong Kong foods, including an edible rating to help you decide what you may find unusual and what may simply not be your cup of tea. If you can brave a thousand-year-old egg, you can consider yourself an honorary Hong Konger – these things are potent! They are made from duck or quail eggs buried in a clay, sand and salt mixture for a couple of months. The shell of the egg turns a browny, black, but it’s the inside where the real surprise awaits. The yolk turns dark green and boasts a powerful smell of, well, eggs that have sat around for a couple of months. The eggs can be picked up whole from street vendors around the city or found sliced up in noodle dishes. Edible rating: 4 out of 10. The funk takes some getting used to! One of Hong Kong’s most prized delicacies, Bird’s Nest Soup is a gelatinous mix of chicken broth and swiftlet’s (a type of bird) saliva. That’s right, you’re eating swiftlet's spit. Swiftlets make their nests from saliva and each year, after the bird has left the nest, it’s harvested and added to the soup. Like many things in the city the soup is famed for its health benefits, though environment-minded eaters avoid it because the industry may endanger swiftlet populations. If you’re still inclined to try some, visit a Cantonese restaurant to order large steaming bowls of bird’s nest soup – then dig in! Edible rating: 8 out of 10, just don’t think about where it’s from! One of the world’s most controversial dishes, shark fin soup retains a strong but shrinking fanbase in the Hong Kong food scene. Demand for this dish in Hong Kong and China is apparently critically reducing the number of sharks in the oceans, causing critical changes further down the food chain. The soup itself is mostly prized for its premium price tag and is a firm fixture in five-star restaurant menus, particularly in demand for weddings and graduation parties. The taste is by no means disgusting, nor is it special, just slightly fishy. The Chinese like to say about themselves, “Beijing people dare to say anything, Guangdong [Cantonese] people dare to eat anything, Shanghai people dare to wear anything.” The Cantonese of Hong Kong prove this by turning a rejected part of the chicken into a cherished dim sum dish. Your biggest obstacle to eating chicken feet is their appearance: these wrinkled, claw like tidbits look like something from a witch’s cauldron. Luckily, they taste better than anything else the wicked witch could cook up, if a little crunchy. Steamed chicken feet are a staple at dim sum restaurants across Hong Kong, one of the most affordable exotic items on this short list. Edible rating: 7 out of 10. Open your mouth and close your eyes. A favorite at hotpot restaurants in Hong Kong, diners chow down on chicken testicles, or gai zi, for their supposed aphrodisiac properties. “The Chinese – especially Hong Kong Chinese – believe in 'you are what you eat',” the South China Morning Post’s Luisa Tam explains. “So you eat the organ to actually nurture your organ." Before eating it, dip the gai zi in the hotpot broth; it’s ready when the exterior turns opaque white. The interior remains soft, exploding inside your mouth when you chomp down on the firm exterior. Have them with rice, or noodles and broth. Edible rating: 4 out of 10. The weird mouth-feel says it all. Like Shark Fin Soup, turtle jelly, or gwei ling go in Cantonese, is another naughty delicacy that doesn't impress any environmentalist. Powdered turtle shells and bellies are boiled for up to twelve hours, mixed with herbs and lotions and served up as a type of jelly-like soup. Turtle jelly enthusiasts in Hong Kong swear by turtle jelly’s medicinal properties – it’s supposed to be a cooling food, helping with coughs, indigestion, and eczema; while beautifying the skin. Authentic turtle jelly – made from the ground-up shells of the Cuora trifasciata turtle farmed on the mainland – can be prohibitively expensive, costing about HKD 300 (or about US$40) per cup. Most of the commercially available turtle jelly in Hong Kong actually contains no turtle shell. Edible rating: 1 out of 10. The medicinal properties are the whole point, certainly not the taste. Like tea? Like coffee? Why not both? In Hong Kong, you can have them mixed together in the same cup, in a combination known as yuanyang. The drink mixes two-thirds Hong Kong style milky tea with one-third coffee. The drink shares its name with the mandarin duck, which is a Chinese symbol of togetherness; as male and female mandarin ducks look completely different yet mate harmoniously, the same is thus said of coffee and tea together. Visit any dai pai dong in Hong Kong to pick up a cup. Edible rating: 8 out of 10. Get it hot in wintertime, or enjoy it on ice during Hong Kong’s humid summers. Hong Kongers’ lingering belief in traditional Chinese medicine explains the continuing popularity of Chinese herbal tea shops. Drinking leung cha (herbal teas) are believed to “cool down” the body, remedying imbalances of heat and cold as prescribed by traditional medical principles. Thus each herbal tea shop has its own, carefully-guarded recipe, no two shops have the same tea formulation. Each cup may contain any of these “therapeutic” herbs: Asiatic pennywort to improve blood circulation; monk fruit to lubricate the lungs; and hempseed to improve digestion. Head for the shops in Sheung Wan and Hollywood Road if you want to give it a go. Edible rating: 3 out of 10. The “tea” in the name might lull you into thinking it’s no different from a cup of Earl Grey, but the strong herbal flavors will correct that belief immediately! Snake soup is considered somewhat of a gourmet dish and a famed winter warmer. Most of the city’s snake meat is now delivered chilled or frozen from China, but to try the meat and the soup at its best you need to have it fresh. This means braving the handful of live snake restaurants that still exist in Kowloon. Here, you pluck your favourite python or cobra from behind a cage and watch him slither to the chopping block, with more unusual snakes attracting heavier price tags. The soup comes with the snake shredded inside, although, if you’re braver, you can try sliced snake in a host of other dishes. As it seems with almost all exotic meats many say it tastes like chicken. Edible rating: 6 out of 10. You might say the snakes in Hong Kong fear to get people-bitten. The Chinese prize four seafoods above all, christening them “the four treasures”: sea cucumbers, shark fin, abalone and fish maw (swim bladders). Sea cucumbers are perhaps the least likely to end up as food, but the Chinese love it nonetheless, eating it in soup or stir-fried. You’d think sea cucumber would be slimy and slightly rubbery and you’d be right. Beginners should try it fried as this takes away some of the slippery texture, or on a bed of noodles or rice with an accompanying sauce. Demand for sea cucumber has devastated many far-flung ecosystems, so avoid if the environment matters to you. Edible rating: 3 out of 10. Not unlike biting into a trampoline.